Bluff View Bank’s debit card is like having your cash, checkbook and ATM card all rolled into one. With our debit card your account balance will automatically update when you make deposits, transfers, and/or withdrawals… so your money will be available to you immediately. Your debit card allows you to make purchases directly from your checking account without the hassles of writing a check. Use your debit card to make purchases at millions of Visa merchants worldwide and skip the checkout delays that come with check approvals and proof of identification. All purchases made with your Bluff View Bank debit card will be listed on your monthly checking account statement for your record keeping convenience. Your debit card is much safer and easier to carry than cash or checks and can be used at ATMs worldwide, anywhere you see the familiar Visa, Plus or Shazam symbols. Instant issue debit cards are available! You can request a card today, and start using it today! Bluff View Bank’s instant issue Visa debit card is also a “chip” card. For just $10 you can create your own personal debit card…personalize it with a photograph. The possibilities are endless- family, friends, pets, or past travel locations. Click myPicStudio to create your new favorite card today! 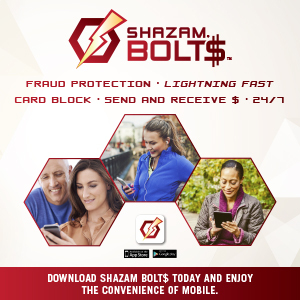 Debit card holders can download the Shazam Bolt$ app to have better control over their debit card use and security. Set it up to alert you to any potentially fraudulent activity. When you’re aware of suspicious activity, call us and put a stop to it! Check your balance information on your smartphone, tablet or home computer anytime, anywhere. Send and receive secure person-to-person money transfers and locate the closest surcharge-free ATM. Anytime, for any reason, you can temporarily block and unblock your card, giving you more control over your account. Misplaced your card or had it stolen? Go to your Shazam Bolt$ app and block your card from being used. We’ve got the low rate credit card with in-house payments and service that you’ve been looking for! When you need to make a credit card payment, have a question about your monthly statement or lose your card, who are you going to call? Why deal with faceless people somewhere behind the 1-800 number when you can deal with the friendly, dependable staff at Bluff View Bank that you know and trust. We service your Visa account right here and can provide you with complete account information! No time to stop in? Click here to pay your bill and manage your account online. Visa ScoreCard is a rewards program that encourages you to use your Bluff View Bank Visa Credit Card for purchases. For every net dollar you spend, you earn Bonus Points that can be exchanged for fabulous travel and brand-name merchandise. There is no enrollment necessary with Visa ScoreCard Rewards so you don’t have to wait to start earning points. To find out what awards are available, simply enter the site and look in the Travel and Merchandise sections. Click here to view the ScoreCard rewards website. Use any Bluff View Bank Visa Credit Card to earn 1 points for every $1 of your purchases online, over the phone or at the checkout counter – that includes hotel reservations and car rentals. The more you spend, the more you earn. Choose from a wide variety of reward options including travel, top quality merchandise and experience rewards. The minimum number of points required to redeem an award is 2000 points. When you use your Bluff View Bank credit card for the purchase of goods or services, the following benefits are yours! Contact us for more information or to request your card today!